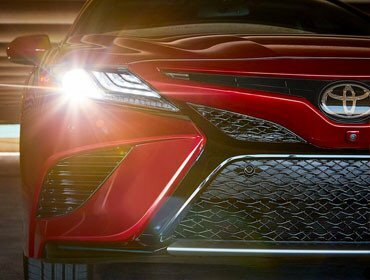 Camry offers a choice of gasoline engines, the all-new 2.5-liter Dynamic Force 4-cylinder and a new 3.5 liter V6, each delivering a sophisticated blend of performance and efficiency. Both engines utilize the D-4S direct-injection system, which selects the optimal injection method based on driving conditions to pack a powerful punch with enhanced fuel efficiency to boot. It proves the rational choice can also be an excited one. Never miss a connection with Camry’s available Wi-Fi Connect Powered by Verizon. The Toyota-first system supports up to five devices, making Camry the hottest spot on the road. Add available Qi-compatible wireless smartphone charging and leave your wires and worries behind. Camry offers an available 8-in. multimedia touch-screen with intuitive pinch-and-zoom navigation controls for a familiar experience. The new Entune 3.0 system speaks to your style with a customizable home screen and standard Entune 3.0 App Suite with available Toyota Connected Services. You’ll even welcome the longest trips thanks to the Scout® GPS Link App with moving maps and available 9-speaker, 800-watt Entune 3.0 Premium Audio with JBL® with Clari-Fi. Camry’s redesigned, available 8-way power-adjustable driver’s and front passenger seats are distinctively shaped with available leather trim and contrast stitching. This combination creates an intimate, tactile connection with the road. Camry’s available Bird’s Eye View Camera with Perimeter Scan uses front-, side- and rear-mounted cameras to display a panoramic overhead view. It helps you get in and out of the tightest spots with confidence. Under certain circumstances, Lane Departure Alert (LDA) is designed to detect lane departure on roads with clear markings. LDA only activates when you’re traveling at a speed of 32 mph or faster. When you hear and see the alert, after carefully checking the road around you, you should safely direct your vehicle back to the center of your lane. In addition, Camry’s Toyota Safety Sense P (TSS-P) and Electronic Power Steering (EPS) include Steering Assist functionality. When it’s activated and senses that you’re unintentionally drifting, the system may automatically make small corrective steering inputs to help keep your vehicle in its lane. Smart tech helps keep you safe. This standard comprehensive suite of six advanced safety features helps keep you out of harm’s way. The system includes enhanced Vehicle Stability Control (VSC), Traction Control (TRAC), Anti-lock Brake System (ABS), Electronic Brake-force Distribution (EBD), Brake Assist (BA) and Smart Stop Technology (SST). 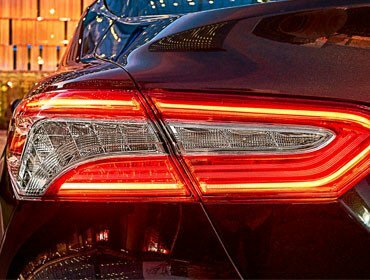 See more of what matters, thanks to Camry’s available Intelligent Clearance Sonar (ICS) with Rear Cross-Traffic Braking (RCTB). This warns you when it detects nearby obstacles and, if necessary, under certain conditions will reduce engine power and apply the brakes. Intended for highways and similar to “constant speed” cruise control, Dynamic Radar Cruise Control (DRCC) lets you drive at a preset speed. DRCC uses vehicle-to-vehicle distance control, which adjusts your speed, to help you maintain a preset distance from vehicles ahead of you that are driving at a slower speed. DRCC uses a front-grille-mounted radar and an in-vehicle camera to detect vehicles and their distance. If a driver is traveling slower than you, or within your preset range, DRCC will automatically slow your vehicle down without deactivating cruise control. If DRCC determines you need to slow down more, an audio and visual alert notifies you and brakes are applied. When there’s no longer a vehicle driving slower than your set speed in front of you, DRCC will then accelerate and regular cruise control will resume. Select Camry model grades feature Full-Speed Range DRCC, which is designed to operate between 0-110 mph. This enables low-speed following, matching speed and, under certain circumstances, stopping before colliding with preceding vehicles on highways.